The introduction of the arquebus to Feudal Japan by Portuguese (1542 A.D) and Dutch (1561 A.D) traders heralded the start of a tactical revolution which would change the face of warfare during Sengoku Jidai. However, it was not until Oda Nobunaga, daimyo of the Oda clan, that the arquebus' importance in Sengoku Jidai warfare would become fully apparent. The rise of the arquebus in Feudal Japan is similar to that which it experienced in Europe. Compared to archery, where many years of training was required, the arquebus required minimal training to use. This meant that several Ashigaru could be trained to use the arquebus in the same time it took one to master the bow. It was amongst the massed ranks of the Ashigaru, and not the Samurai, that the arquebus became the feared weapon that it was. 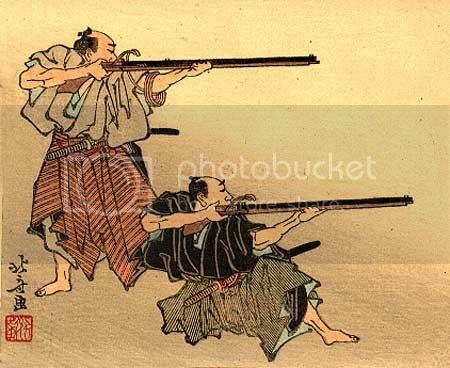 Being a smoothbore weapon the arquebus was not effective when used for long range sniping by the Samurai. However, when used by the massed ranks of the Ashigaru against other massed formations the qualities of the arquebus shined brightly. As European generals had discovered, the arquebus' weaknesses as an individual weapon could be papered over by its use as a weapons system, in this case the organised mass firing of the arquebus by Ashigaru battalions. It would take the genius of Oda Nobunaga to solve one of the few problems that still dogged the arquebus. The Ashigaru were vulnerable to enemy counter-attacks while reloading their arquebuses - so allied Samurai or Ashigaru, who were not equip with the arquebus, would protect them during this uneasy time. Oda Nobunaga solved this problem by drilling his arquebus Ashigaru to fire in sections and not as a whole. This meant the enemy was under a constant barrage of fire, with the arquebus Ashigaru now better able to cover each other. The power of the arquebus in the hands of the massed ranks of Ashigaru would help Oda Nobunaga to defeat the Takeda at the battle of Nagashino (1575 A.D). Here the power of the arquebus and Oda Nobunaga's drills paid off as they nullified the head on charge of the Takeda's notoriously superior cavalry. While the arquebus was prone to not working in wet weather Oda Nobunaga had managed to keep his arquebuses dry during the preparations for battle. To maximise the potential of his arquebuses Oda Nobunaga deployed his Ashigaru in the first line. While traditionally the first line was reserved for the Samurai caste as a right and position of honour Oda Nobunaga was a strategist and realist, not afraid to do away with tradition when it suited. This allowed the arquebus Ashigaru to try and break the enemy before the supporting infantry and cavalry charged in to combat. Is it a coincidence that Oda Nobunaga came close to the Shogunate, before his unfortunate death, thanks to his willingness to forgo tradition and honour in order to maximise the effectiveness of the arquebus? While his rivals also adopted the arquebus it was Oda Nobunaga who was prepared to sacrifice all to make the arquebus the focal point of his army. That is not to say he did not respect his other Ashigaru or Samurai regiments, just that they acted as the support to, and not as, the focal point of his army. The development of firearms, and the strategies and tactics revolving around them, slowed with the start of the Tokugawa Shogunate. The Edo Period ushered in a long period of peace and prosperity throughout Japan, where cunning diplomacy more so than military action was the order of the day. Who knows how military equipment, tactics and strategy could have evolved if Sengoku Jidai had continued for another 100 years. Firepower when used right can beat most armies who are reliant on melee weapons. A shame that Nobunaga died or we might have seen him be the Shogunate of Japan. I liked how he mixed up his forces to maximum effect and obviously showed in the battle against Takeda. Loved it, great overview with some great observations. For example; Oda Nobunaga's rapid ascension to be the most powerful Daimyo in Japan, no doubt thanks to his adaptation of 'fire by rank' type arquebus tactics. This would mean that for 19 in-game years we would need to go without firearms if we decide to wait for the Dutch traders...but with 4 seasons per turn that makes it an agonising 76 Turns! That's a long time, let's hope it is shortened, or even better, randomized like the Marian Reforms in Rome. That is a tough balancing decision to make. One has to remember that the Dutch (in STW at least) have none of the drawbacks that the Portuguese have. While the Portuguese bring gunpowder early on (literally just a few turns from the start) in the game they also require you to adopt Christianity. The Dutch bring gunpowder with none of the drawbacks that the Portuguese bring, at the trade off that they appear later. If the Dutch traders come too soon in the campaign then the Portuguese traders are rendered useless by the Dutch's "gunpowder for no drawbacks" approach. Is it a coincidence that Oda Nobunaga came close to the Shogunate, before his unfortunate death, thanks to his willingness to forgo tradition and honour in order to maximise the effectiveness of the arquebus? If he had not been so willing to buck tradition and honor, would Mitsuhide have betrayed him? It is a bit of a big what if, but it is possible that if Oda Nobunaga had more respect for the traditional ways he could have still been alive. However, it could be that Akechi Mitsuhide was always going to betray him, ironically (rumouredly) killing him with his own favourite weapon the arquebus in an ambush. If Oda Nobunaga did have more respect for the traditional ways then it is possible that usage of the arquebus would not have progressed how it did. Ieyasu, after the death of the Imagawa clan and his switch of allegiance to Oda Nobunaga.